I’m writing in regard to your recent casting announcement for Star Wars Episode VII. In doing so, I’ll come right to the point; I find the lack of diversity disturbing. Through the lens of Star Wars on film, the galaxy far, far away is not a particularly representative place. Though I’m inclined to give the original trilogy a pass as a product of 1970s and early 80s film making, I feel no such compunction toward the prequel trilogy. Therein, female characters exist primarily as love interests to male characters. People of colour, particularly Mace Windu as portrayed by Samuel L. Jackson and Jango Fett as portrayed by Temuera Morrison, are reduced to token character status for Episodes I, II, and III. In point of fact, Windu’s role in the films is considerably less substantial than what we saw from Billy Dee Williams as Lando Calrissian in Episodes V and VI. Non-human characters see their innate sense of otherness established through obvious human racial memes, which in and of themselves border on Vaudevillian caricature. Even as an eighteen-year-old watching The Phantom Menace in 1999, I found the Gungan’s and Neimoidian’s patterns of speech to be problematic. In so much as Star Wars on the big screen has mirrored the Galactic Empire’s preference toward white human males, Star Wars on the small screen is much more progressive. The Clone Wars offers genuine parity between named male and female characters. The series regularly passes the Bechdel Test for placing female characters in frame for purposes that don’t include discussing men. As people of colour, the clones themselves are as important to the story as the Jedi characters. Otherness in the aliens is generally represented through physical differences and in native environments (e.g framing the Mon Cala and Quarren within their aquatic home world). While The Clone Wars might not be perfect, and here I’m thinking about George Lucas’ directive to imbue Ziro the Hutt with Truman Capote’s voice, it is generally much more conscious in its efforts to include more than just white people in the story telling. 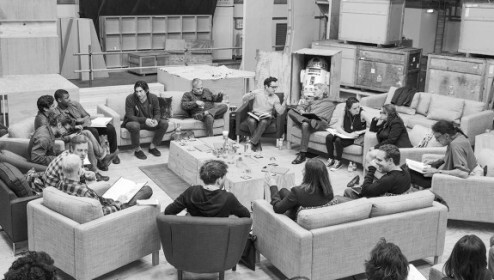 Even the upcoming Star Wars: Rebels seems to feature gender parity within the primary cast. It is for the above reasons that I find the recent casting announcement for Episode VII to be such a tragedy. How am I to view one person of colour and two female actors as anything but a return to love interests and token characters? Furthermore, how can it be that one arm of the Star Wars universe is happy to align itself with the fact that Star Wars has an audience beyond straight white men, while the other appears equally content to pretend that popular narratives have not evolved since the 1960s? Though I acknowledge that my words are about as likely to affect real change as a Tauntaun is to make it past Echo Base’s first marker during a cold Hoth night, I nonetheless feel the need to make my futile gesture. To that end, I would invite Abrams and company to consider the Jedi philosophy of balance. If the current cast is any indication of the characters who will inhabit the next generation of the Star Wars Universe, then it will most certainly be a place without balance. The virtues of the New Republic and Jedi Order will seem shallow and vapid when espoused by a cast that treats women and people of colour as bit players in a story that is literally eclipsed by old white actors. Star Wars deserves better than that; indeed, a younger cohort of fans deserve better than that. Thus will I exercise the Jedi virtue of patience, and hope that you come to see the error of your ways. Adam Shaftoe-Durrant, a straight, white, male, who demands more diversity in Star Wars.